Ol' Backwoods says: If you're the kind of person to comment, "TL;DR", then I ask you to leave this site, now. American patriots who wish to learn the truth about the tyranny and abuses of their government are encouraged to stay and read. As we peer into society's future, we – you and I, and our government – must avoid the impulse to live only for today, plundering for, for our own ease and convenience, the precious resources of tomorrow. We cannot mortgage the material assets of our grandchildren without asking the loss also of their political and spiritual heritage. We want democracy to survive for all generations to come, not to become the insolvent phantom of tomorrow. --'Barack Hussein Obama,' July 2, 2008, before being elevated to President of the United States. The Left's silly, childish view of the world, that the government is our boss, shows their willingness to use guns to get what they want, while our view is one of constant vigilance against a government too willing to use their weapons against us. I will never fire upon a federal agent first. Our rules of engagement are strictly 'do not fire until fired upon'. -- Patrick Downs, 20-year-old militia member from California, who has pledged to protect Cliven Bundy, his family and their ranch from another raid by the federal government. 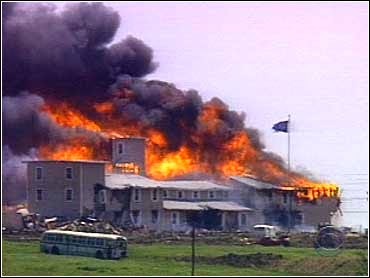 I hate to say it but I’d rather have seen another Waco than yet more caving by the Obama administration to the radical right-wing lunatic fringe. 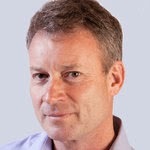 -- New York Times opinion page writer Timothy Egan, 4/17/14. the states and people that created it. 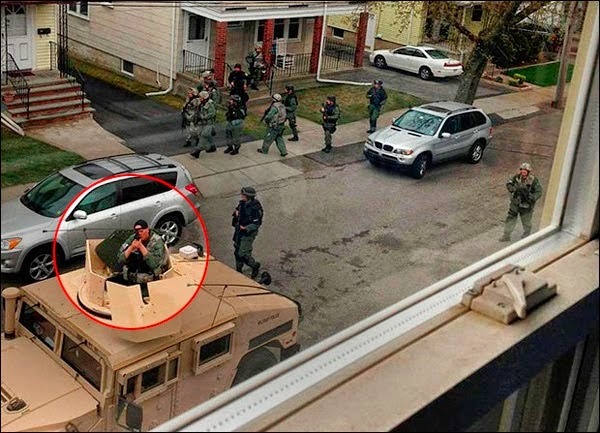 A year ago today, when Watertown, Massachusetts was on federal "lockdown" ostensibly because of a teenage 'terrorist,' and crack DHS dragoons were sighting M-4 rifles at citizens through windows, few could have imagined that the struggle of the American people against the usurping US government could get much worse without breaking into open civil war. Yet, it has. 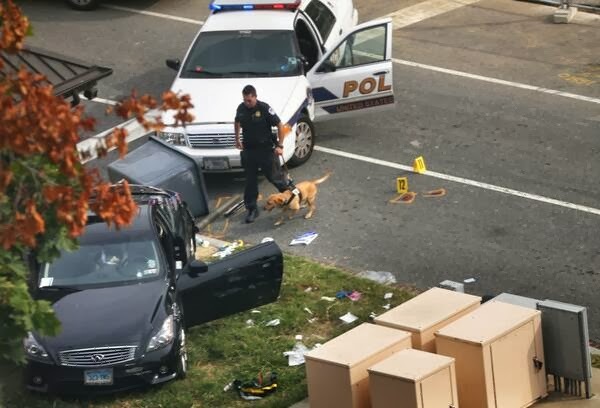 In the year since Watertown, a unarmed young female dental hygienist from Connecticut, who likely did nothing but fall on the losing end of some sort of lover's spat with a federal goon, was gunned down in cold blood in Washington DC as she fled from the "Secret Service." The young girl in the seat next to her was covered in her mother's blood. The federals and their allies in the news media quickly suppressed any investigation into what happened. Also, in the last year, the IRS, in collusion with the US Department of 'Justice' and the Federal Elections Commission, was caught suppressing the free speech of people opposing the Obama administration en masse, including a local "Tea Party" group in Wetumpka, Alabama. The guilty IRS official, Lois Lerner, though held in contempt of Congress, has so far escaped prosecution by the judiciary, federal or state. It seems that anyone critical of Obama personally, of his policies or those implementing them are in Federal crosshairs. In a somewhat related development, Hawaiian health official Loretta Fuddy, seemingly the only person who knows for sure if so-called Barack Hussein Obama is indeed a foreign national living under an alias, was mysteriously killed in a single-plane accident, in which she was the only casualty. The Left, ever defending the administration, has blamed her death on a "cardiac arrhythmia". One wonders how they know. Yes, in the last year, Federal disobedience to the Constitution and the resulting tyranny have gotten much worse. Nowhere can this be more clearly seen than in the federal siege and looting of Cliven Bundy's ranch near Bunkerville, Nevada. Thankfully, the so-called "Battle of Bunkerville" ended peacefully, with none dead except dozens of cattle, and the Feds retreating. But the cold civil war in America is not getting any better. In fact, the nature of the federal threat means that there will be more battles, and worse. Fueled by a fiat currency from a powerful international cabal of banks, the elite-controlled US government uses the unconstitutional but heavily-armed Executive-branch agencies to loot property by force from citizens, calling the thefts "income tax" and "civil forfeiture." The Feds use the proceeds to maintain its power and to pay fealty to the bankers. Many of the states are emulating their federal feudal lord in looting their own citizens to buy votes and weaponry to maintain their elites' power. At the federal, state, and local level, America is a rapidly-developing police state. 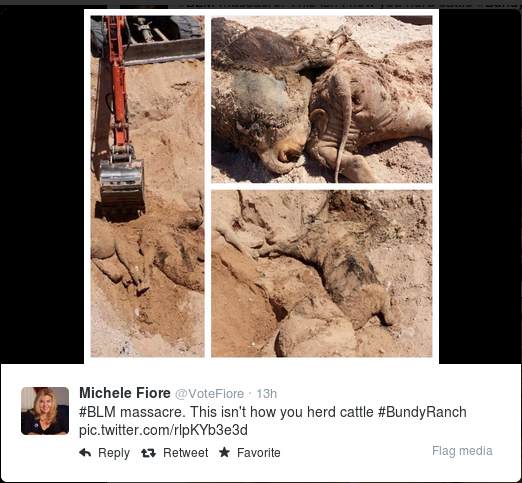 Federals killed and buried many of Bundy's cattle. The bankers and the US federal elites have powerful local allies, such as the Islamist infiltrators, the illegal alien advocates and the radical environmentalists. (Radical environmentalism is effectively the national religion of the Federals and their allies.) The federal cabal uses the grievances of these anti-American interest groups as its justification to intimidate, impede, control, loot and ultimately destroy manufacturers, farmers, ranchers, and energy producers. The end goal of this destruction is not clear, but one can conjecture that the carcass of the United States would be useful raw material for our enemies abroad, allies of the bankers and political elites. The cabal and its allies place their safety above the Constitution and the American people. Anyone who resists the Feds' unconstitutional tyranny is threatened, injured, or murdered outright by the armed federal police. Which brings us again to Cliven Bundy's Ranch. 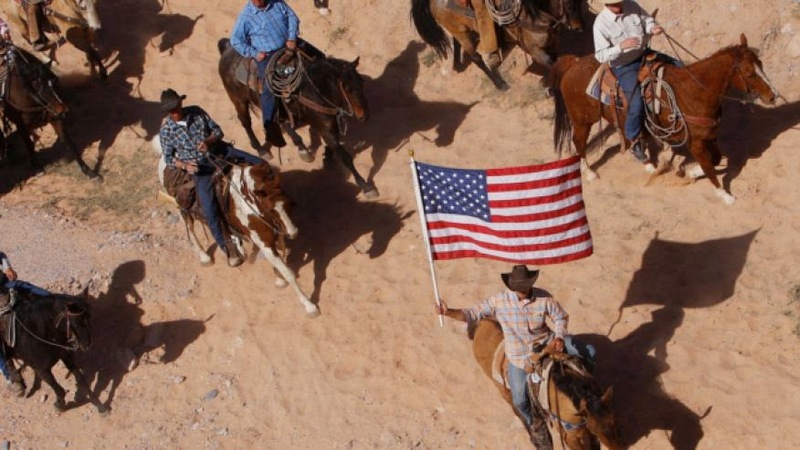 The Left charges that Bundy is getting what he deserved because he hasn't "paid his fees." Much has already been written to refute that simplistic story. Regardless of what one thinks of the Feds' case against the Bundys, the Feds' hostile move to abandon administrative and judicial redress, and employ an armed SWAT team against the man and his family, is indicative of just how the federal government operates in the Age of Obama. And Bundy is not alone in being targeted by the Bureau of Land Management; a tribal leader is suing the BLM for millions, for what was done by the BLM on tribal land. The fact that the armed BLM officers and their hired dragoons turned tail and ran on the afternoon of April 12th was indeed a great victory for the states and the American people. It is, as the Daily Bell puts it, a "significant moment" in American history. But as Senator Harry Reid, most powerful person in the US Senate, recently spat, "This isn't over." The Empire will strike back. Count on it. The US government elites, their feudal masters, and their allies are seething over the April 12th retreat of federal forces at Bundy ranch. 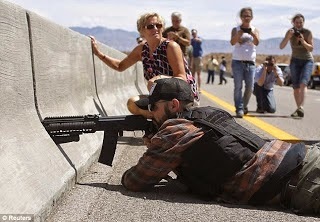 An account of the withdrawal by an LA lawyer indicates how surprised the BLM was that such a resistance materialized so quickly, and how the cowardly agents felt threatened by Bundy and the citizen militias. The fear and loathing from this outcome has resonated throughout the collectivist/traitor axis. 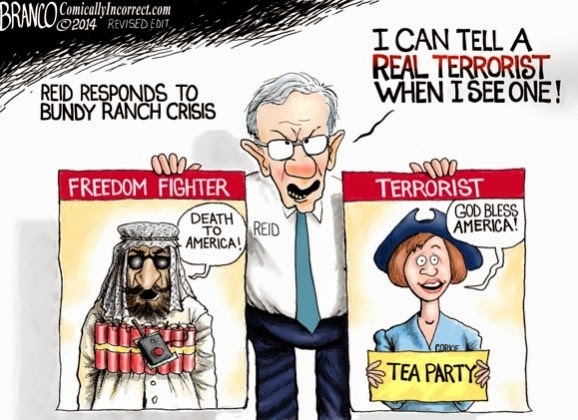 Reid is still fomenting threats, calling Bundy supporters "domestic terrorists". On many collectivist websites, the Feds' acolytes are cajoling their masters to strike back at the militias. The news media is attempting to determine who the militia groups are, doubtless to provide their federal masters with actionable intelligence. The radical environmentalists are "sad that the guys with guns dictate policy" -- by which they mean the militias, because their "guys with guns", the BLM agents and company, showed the white feather and ran for the hills. Besides the potential Federal counter-attack, which has yet to fully materialize beyond the screeds of Lefty keyboard commandos, another front is opening in this civil war: the rebellion of the Western states against Federal land ownership in their states. 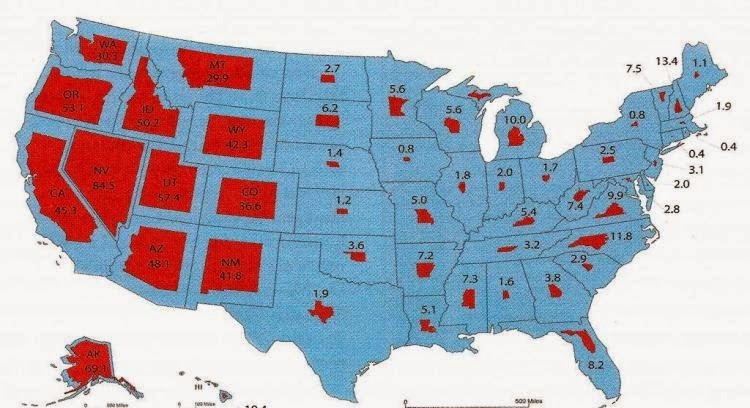 In Nevada, home of Cliven Bundy's ranch, Federal ownership is over 80% of the total land area. It’s time for Western states to take control of federal lands within their borders, lawmakers and county commissioners from Western states said at Utah’s Capitol on Friday [04/28/14]. “Those of us who live in the rural areas know how to take care of lands,” Fielder said, who lives in the northwestern Montana town of Thompson Falls. “We have to start managing these lands. It’s the right thing to do for our people, for our environment, for our economy and for our freedoms,” Fielder said. Emphasis mine, Backwoods Engineer. And he's correct-- Bundy Ranch is just a symptom of a larger problem with federal encroachment onto state sovereignty and Constitutional limits. Idaho, New Mexico, Arizona, Nevada, Wyoming, Oregon and Washington also were represented, but none of the other states has gone as far as Utah, where lawmakers passed a measure demanding that the federal government extinguish title to federal lands. The lawmakers and Gov. Gary Herber have said they’re only asking the federal government to make good on promises made in the 1894 Enabling Act for Utah to become a state. The intent was never to take over national parks and wilderness created by an act of Congress, said Lockhart, a Republican from Provo. Ivory said federal government’s debt threatens its management of vast tracts of the West and its ability to make payments in lieu of taxes to the states, the Tribune reported. He said the issue is of interest to both urban and rural lawmakers. “If we don’t stand up and act, seeing that trajectory of what’s coming … those problems are going to get bigger,” Ivory was quoted as saying. Indeed, the federal incursions will only get bigger and bloodier. Next Patriot's Day, it's hard to tell what I will be reporting in this space, dear reader. Pull quote: "A [federal wielding a] sniper rifle is not due process, and we cannot let that stand as legislators, no matter what state we are in." Also: "The best government is the government closest to the people." They blinked and retreated here for now. They will try again, if not here then in some other place for some other flimsy tyrannical excuse, some other evil wrapped in an allegedly benevolent lie. Rest assured, they will try again. And we must be ready. We must remain vigilant. But however we arrived at this place, we are here, now, and there is no changing it. When you stood beneath the bridges we -- all of us, all across the country -- in those long moments we were staring civil war in the face. All over this country at this moment WE ARE STILL STARING CIVIL WAR IN [ITS] BLOODY FACE. To believe otherwise is to whistle past the graveyard of our own history. We have, to use the blunt words of my Michigan farmer Grandpa Vanderboegh, arrived at "nut cuttin' time." This is not about tortoises and cattle. It is not about who controls the vast lands claimed by the federal government. It is not about "the children" or "common-sense gun safety" or any of the many lies that are spun to conceal the iron fist of arbitrary power. It is about control. It is about who serves whom. We are divided now, as they were in 1775, by the answer to the most fundamental of questions: Does the government serve the people or do the people serve the government? Who serves whom? What do you think? Right. Now we believe, as did the Founders, that government should serve the people. It is evident that many others believe differently. But this is not a question whose differing answers can be compromised, or negotiated or finessed. It is one or the other -- that of individual liberty codified by the Constitution and the rule of law under the Founders' republic, or the rule of man as represented by the law of the jungle backed up by the iron fist of tyrannical government. Harry Reid understands this. You all saw what he said the other day: "This isn't over," he threatened. And you know what? He's right. It can never be over until one side or the other wins. And don't think he's just talking about the Bundys. He is promising us all civil war on a vast scale because state-sponsored violence is the only way they can win the argument with free people, especially free people who are armed and willing to use those arms in defense of liberty. Ole Dirty Harry understands that. But he mistakes the character of the people he wishes to victimize and subjugate. He mistakes you. 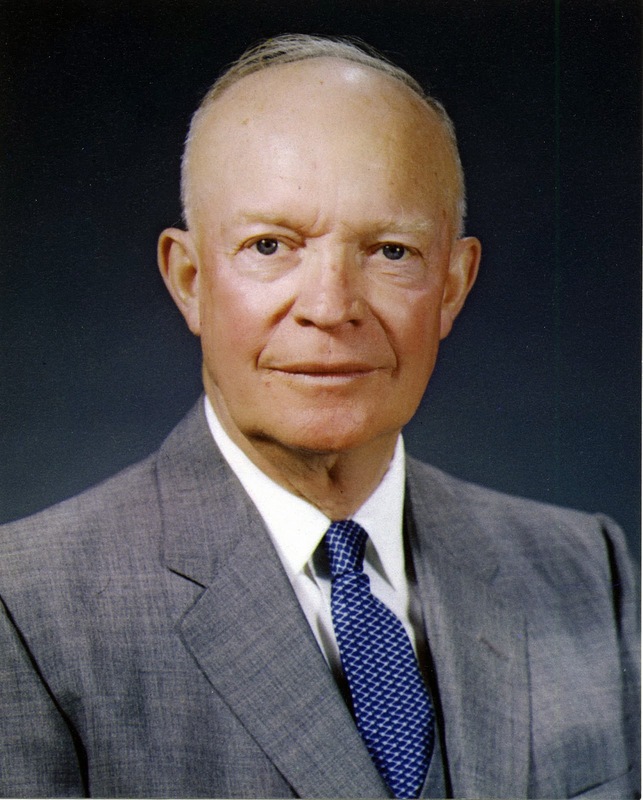 He mistakes the true nature of all free Americans who intend to remain free. And history has shown that mistake to be a terminal one for many tyrants. For there are laws higher and older than any of Harry Reid's unconstitutional "laws," one of which is the Law of Unintended Consequences. Good stuff. Read it all.